A back injury is debilitating. Simple tasks such as tying your shoes or getting something out of the pantry can be very painful activities. Despite your pain, life must go on. You may be able to reduce your hours or activities at work to accommodate your injury. Regular household chores must be done however. 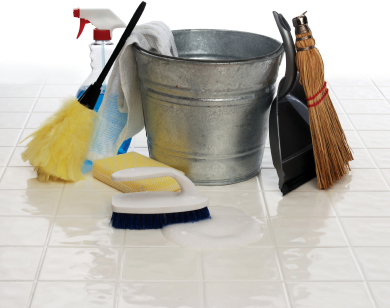 Here are some tips to enable you to alleviate the pain associated with getting your household chores completed. • Instead of putting your laundry in a basket, use a laundry bad with straps on it. Carrying the load on your back like a backpack takes the strain of your lower back. • Keep your laundry basket and hampers on a table, or elevated off the floor. This will eliminate the need for you to bend down to pick it up. • Install supporting bars into your shower and tub to provide assistance when you get in and out of the bath. In addition, install a foot bar inside the shower so you don’t have to bend over to wash your feet and legs. Install supporting bars around the toilet as well to assist the strain on your back. • Purchase washer/dryer risers to get your washer and dryer elevated. Bending over and lifting wet laundry can cause a back injury to a very healthy person, let alone someone with an existing injury. • Instead of using sheets and blankets, use a duvet cover. It is easier throwing a blanket on a bed than it is to tuck in sheets and a blanket. Make the bed on your knees instead of standing and bending over. • Organize your cabinets and drawers so that the items you use more frequently are within easy reach. Always use a step stool to reach items on high shelves. • Finally, take frequent breaks to give your body a rest. Do a brief warm up prior to starting your chores. If your injury is so severe that these suggestions are not enough to allow you to get your chores done, give a chiropractor a call. The minor adjustments, which have been recommended, should get you through a mild to medium back injury as you heal. If however, you are suffering in pain and not being treated by a medical professional, call a chiropractor. Chiropractors are instrumental in restoring backs back to health so you can get back to living your life. Dubuque Chiropractor | Newsletter. Dr. Kevin Mueller, DC is a Dubuque Chiropractor.